Looks like time has run away with us again and it turns out it’s been a few months since I last posted anything here. Sorry! Here are a few recent pictures of Zoe. 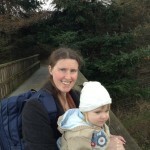 On the walkway at Edinburgh Zoo, looking at the zebras. Granny and Grandad took us to Edinburgh Zoo. 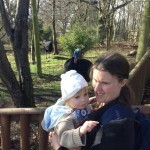 Not sure whether we’re photobombing the cassowary or it’s photobombing us. 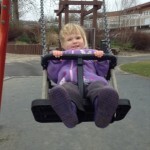 Zoe still loves the swings. 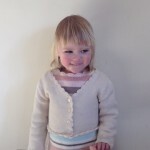 This was one of many attempts to take a passport photo of Zoe. She now has a very cute passport. Zoe loved going to the zoo. She’s fond of all animals. She was a little disappointed that the pandas were boringly asleep, but enjoyed the koalas and the monkeys. She wants to walk everywhere and requests ‘Shoes. Toddle.’ at every opportunity. Until she gets tired and then it’s ‘Mummy carry-oo!’ She also loves to be read to: current favourites include The Cat In The Hat, Hand Hand Fingers Thumb, Bringing Down The Moon, We’re Going On A Bear Hunt, and anything with photos of items for her to point to and name and count. An Easter catalogue from Aldi was a big hit. Rhiannon is a small, short-haired soprano who also plays the cello. Rhiannon is also on Facebook.